PHOTO: The journey begins in the Norwegian town of Bergen. Photo courtesy Bergen Tourist Board. It started 120 years ago as a mail and cargo shipping line, but Hurtigruten now offers 11 ships cruising along Norway’s coast catering more to both foreign and local passengers. The company’s ships, which make their way through over 100 fjords and 34 ports of call, sail daily between Bergen in the south and Kirkenes in the north near the Russian border. Cruise passengers can opt to do just the northbound or southbound leg of the trip, or take the classic 12-day voyage north from Bergen to Kirkenes, and then back south again to Bergen, with 50 excursions along the way to choose from. While the northbound voyage features more time in each destination, the southbound sailing has more active excursions, such as a snowmobile trip in the polar night from the northernmost mainland town, Mehamn, riding over mountains to the small fishing village of Kjøllefjord. A typical seven-day summer northbound voyage can be experienced onboard the 1,000-passenger Finnmarken, built in 2002 and the only one of the company’s ships that features a swimming pool and two Jacuzzis on deck. The Art Nouveau-style ship features luxuries like a sauna and large fitness room, as well as formal dining room with panorama windows overlooking the sea. The Finnmarken’s 283 staterooms range from standard cabins starting at about 64.5 square feet to more spacious accommodations ranging from a 301-square-foot suite to the 484-square-foot owner’s suite, which features two rooms with a seating area and dining table, as well as a private balcony. A typical mini-suite comes with a double bed, a seating area with a coffee table and a couch, a desk and a chair, a minibar and free (but spotty) Wi-Fi Internet access. The real highlight of any Hurtigruten cruise, however, is not the onboard accommodations or entertainment. 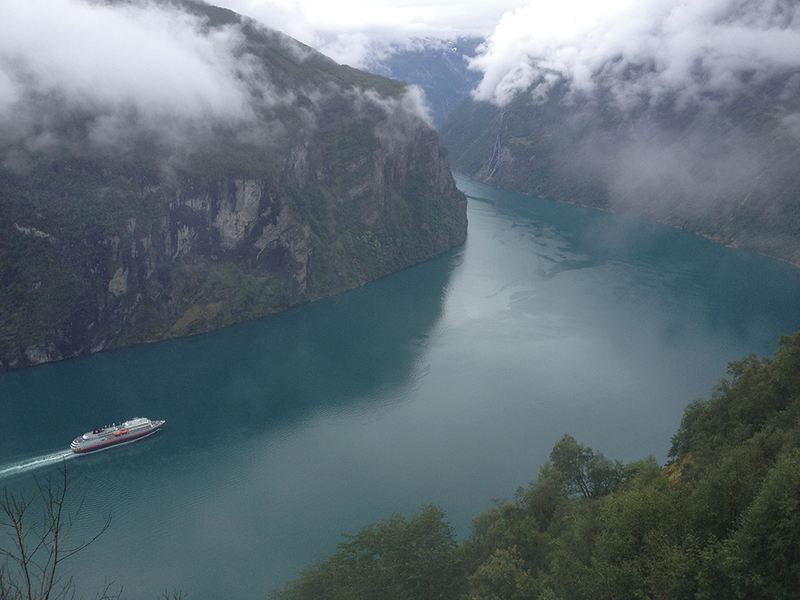 Instead, passengers can focus on the spectacular scenery of the fjords, villages and mountains. The Finnmarken offers plenty of ways to take it all in from the indoor panorama lounge with captain chairs to the outside promenade deck wrapping its way around the ship. Guests also can take advantage of the shore excursions to see more of the country, as well as the fresh local produce incorporated into each night’s dinner. The cruise begins in the UNESCO World Heritage City of Bergen, known for its colorful old wooden houses on the old Bryggen wharf, which served as a center of trade for the Hanseatic League from the 14th to 16th centuries. 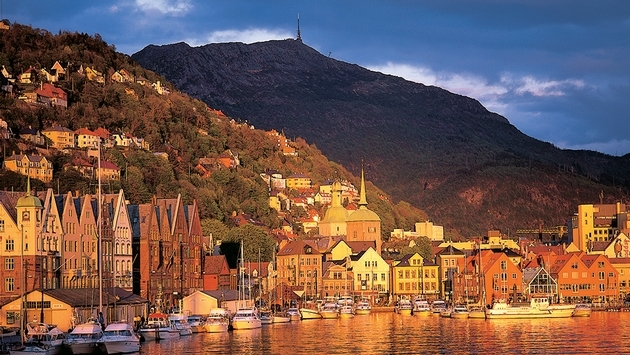 It makes sense that the trip starts and ends here, since the city is known as the gateway to the fjords of Norway, and it has become even more popular this year thanks to Disney’s “Frozen,” which uses Bergen as the inspiration for the kingdom of Arendelle. During the summer season, the ship stops in the Art Nouveau town of ålesund at 8:45 a.m. and again in the evening at 6:15 p.m. While some ålesund shore excursions are offered at various times of the year, guests can go and explore on their own and then catch the ship when it returns in the evening. One of the best ways to experience the city is from above, climbing up 418 steps to the top of Mount Aksla for a picture-perfect viewpoint of the jewel-colored buildings below. After the morning stop, the Finnmarken sails on to the Geirangerfjord, another UNESCO World Heritage Site, passing the Seven Sisters waterfalls along the way, which makes for the perfect photo op from the top deck as the ship sails into port. One of the more popular excursions on the northbound trip, and the only offered onshore program of the day, is the eight-hour Geiranger excursion, which takes travelers on a guided bus tour up steep ørnevegen (Eagle Road) for sweeping views of the fjord. As the bus winds up and around mountains, valleys and waterfalls, and along the Trollstigen Pass’s 11 hairpin bends, guests have plenty of opportunities to get out and take photos of the passing scenery. PHOTO: The scenery is what truly defines this journey. Day 3 Trondheim: In the morning, the Finnmarken pulls into the port of the old royal city of Trondheim, founded by Viking King Olav Tryggvason in 997. On the three-hour bus tour of Trondheim, guests visit the Gothic-style Nidaros Cathedral, said to be built on top of where St. Olav was buried, before heading to the Ringve Museum of Natural History. The city center is also just a 15-minute walk from the port and is easy to navigate by foot. Guests can take in such sights as the Royal Residence of Stiftsgården, a wooden mansion on one of the main streets, as well as the Bakklandet area on the east side of town near the river, which is connected to the city center by the Old Town Bridge. The area is known for its old wooden buildings now transformed into restaurants and shops, such as the charming Baklandet Skydsstation café located in a building dating to the 1700s. The fourth day of the cruise is packed from morning until midnight, starting with the Arctic Circle crossing and ending with the Trollfjord. Early risers can catch a glimpse of the globe statue as the ship crosses the Arctic Circle, and can later celebrate this event with an afternoon “baptism” ceremony on board. Just after the crossing a six-hour excursion is offered where guests can visit Svartisen, the second-largest glacier in Norway near the port of ørnes. While the excursion doesn’t go up to the glacier, guests can take a short hike or a bus up to the glacier before taking a tender boat back to meet the ship in Bodø. In the evening, guests can feast in a recreated Viking chieftain’s home in the Lofoten Islands, complete with costumes, singing and homemade mead. The evening finishes on the ship during one of the much-anticipated fjord visits, sailing through the scenic Raftsund fjord to the Trollfjord with a celebration of “Trollfjord soup” and singing on the top deck. The starting point for Arctic expedition trips, Tromsø offers guests the chance to visit with huskies while learning about dog-sledge driving on Kvaløya. Alternatively, they can check out the Arctic Cathedral on a bus tour of the town, or take a tandem sea kayaking trip of the nearby islands, one of the more active excursions offered on the northbound journey, but still perfect for beginners. The sixth day of the cruise is really all about the North Cape, the northernmost point in Europe, and it features one of the top excursions on this voyage. Guests disembark at the port of Honningsvåg to take a bus tour around the tundra on the island of Magerøya, past herds of reindeer and a Sámi camp of indigenous, nomadic people who herd the 5,000 reindeer on the island. The North Cape juts out over the Arctic Ocean and is marked by a statue of a globe, which looks out over open ocean. For those who want to experience more of the Sámi culture, there is a “Taste of Lapland” dinner excursion in the fishing village of Kjøllefjord, where guests can learn about the culture and lifestyle of these people from a father and daughter team in a Sámi camp. They also can sample reindeer broth in a teepee-style tent and hear a traditional Sámi song. After cruising 1,540 miles from Bergen, the Finnmarken arrives in Kirkenes, located about six miles from the Russian border, which is the turnaround point for Hurtigruten. Those guests who want to go to the Russian border can take a trip to Storskog station or go by riverboat up the Pasvikelva River. Kirkenes also is a spot where outdoor adventurers can take off on a snowmobile safari over a frozen fjord, reach the Russian border by ATV safari, or take a husky sledge trip through the Arctic. Fares for the fall northbound voyage (Sept. 1-Oct. 31) range from $3,912 to $5,633 per person; winter fares (Nov. 1-Dec. 31) range from $2,655 to $4,789 per person; and summer fares (June 1-Aug. 31, 2015) range from $5,750 to $7,494 per person. These prices include three meals served daily in the Restaurant Finnmarken. Guests can purchase a water package (since water is not included with meals), which includes one bottle of still or sparkling water with lunch and with dinner, or they can opt for the wine package, which also includes two bottles of still water per day and one bottle of wine per person or couple with dinner. 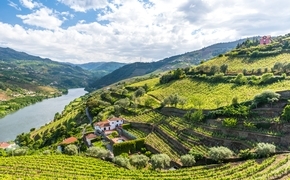 The water package for the seven-day northbound journey includes 11 bottles and costs $41; the wine package includes six bottles of wine and costs $375. Guests also can buy food and drinks at the quick-service Mørestuen Café or Babettes Café, purchase alcoholic beverages at the bar in the top-deck Panorama Lounge, or order breakfast in their cabin. For more information, call 888-912-2571 or visit www.hurtigruten.com.